Democrats face their own pressure to shed their cautious midterm strategy and hammer the opposition for fostering what Democratic leaders are labeling “a culture of corruption” that starts at Mr. Trump and cascades through two indicted House Republicans to a series of smaller scandals breaking out in the party’s backbenches. 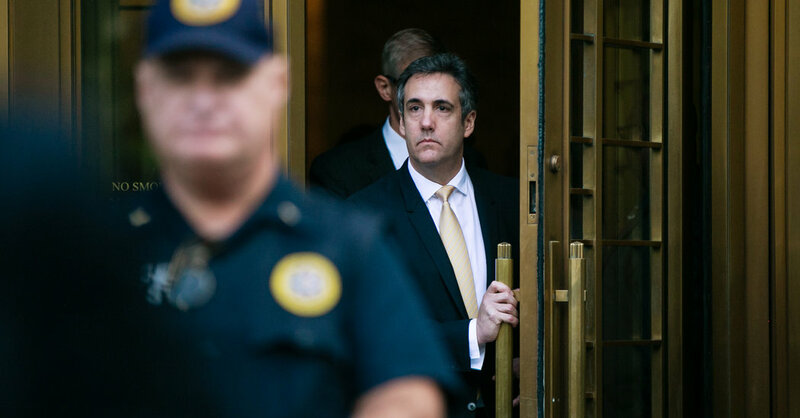 One day after Michael D. Cohen, the president’s former lawyer, implicated Mr. Trump in payoffs to two women before the 2016 election, and the former Trump campaign chairman Paul Manafort was convicted of eight felonies, Republicans were concerned that the worst may be to come in the House, although the party’s senators expressed few worries. By urging some candidates to speak out or at least stay silent, Republican leaders who gravely fear losing control of the House risked opening the first significant rift between the Trump White House and the Republican-controlled Capitol. On cue, Representative Carlos Curbelo, Republican of Florida, called the accumulation of Trump-related scandals a “sad chapter in our country’s politics” and said that “no one is above the law.” Mr. Curbelo, in a tough re-election fight, also reproached the president for his caustic attacks on the special counsel, Robert S. Mueller III. Nearly as alarming to House Republicans were the mushrooming scandals in their own chamber, misdeeds that may dampen turnout among conservative voters. Only hours after the convictions of Mr. Cohen and Mr. Manafort, Representative Duncan D. Hunter of California was indicted on a charge of using campaign money to fund a lavish lifestyle, including the alleged purchase of golf shorts masked as a charitable veterans contribution. Those charges came only weeks after Representative Chris Collins of New York was arrested on charges of insider trading, something that has also tarnished a handful of his colleagues, including Representative John Culberson, an endangered Texas Republican. Mr. Collins and Mr. Hunter were Mr. Trump’s two earliest congressional supporters. In Virginia, Representative Scott Taylor is accused of forging signatures to get an independent on the ballot this fall to help save his seat. And in Florida, Representative Vern Buchanan is accused of accepting a seven-figure yacht loan from a bank lobbying for last year’s tax cut, then purchasing the 73-foot vessel on the same day he voted for the measure he helped write. “It has been a really bad August,” as Mr. Cole put it. To date, Democrats have urged their candidates to conduct their own races and avoid a national campaign against Mr. Trump or the Republican Congress, except on carefully targeted issues like health care costs. Mr. Trump’s scandals, they argued, will play like background music that they do not need to accentuate. But the summer eruption of apparent Republican malfeasance has some in the party arguing that Democrats should make corruption more central. Democratic strategists overseeing the midterm elections said they would use corruption against those Republicans tarred by any wrongdoing, but they were not yet convinced that focusing on what some in the electorate view as unending Washington drama would be more effective than highlighting policy differences. Democrats also worry that employing a Trump-tinged message about corruption will only prompt more questions about whether they would use a new House majority to impeach Mr. Trump, a campaign that could rile an otherwise demoralized Republican base. Democratic leaders have studiously avoided the “I”-word for months amid liberal outcry, preferring to shift the burden onto Republicans who have all but ceased conducting oversight of the Trump administration. But the criminal implications of Mr. Cohen’s guilty plea will raise the pressure on Democrats from their own base. As news of a Cohen plea deal was circulating Tuesday, House Democratic leaders urged members on a private call to stay on message, avoiding the topic of impeachment. Instead, Democrats will cast themselves as offering a check and balance on the president, a message that their polling indicates voters respond to favorably. But this is an election year in which the battles for the House and Senate are being fought on drastically different terrain, with many of the most competitive House contests taking place in suburbs that revile Mr. Trump and control of the Senate hinging on a group of Democrats from more rural states that he won overwhelmingly. So even as House Republicans suggested that their most at-risk lawmakers should tread gingerly around the embattled president, some of their Senate counterparts taunted Democrats for trying to curry favor with Mr. Trump. Some Democrats from pro-Trump states said they had no immediate plans to highlight the matter of the president authorizing an undisclosed payoff to a pornographic film actress with whom he had an affair. Given the health of the economy and relative stability abroad, Mr. Trump’s approval ratings are already significantly lower than what virtually any other president would be enjoying at this moment of his administration. And if there is one predictable element of this otherwise unpredictable presidency, it is that some new story will detonate in the days or weeks ahead, pushing the last eruption off the home page and television chyron. Indeed, Republicans are wishing that the Manafort and Cohen felonies only wind up being this week’s version of the Omarosa tapes — the latest ephemeral drama to captivate the capital but barely faze voters. But party officials are apprehensive about what more Mr. Cohen may reveal on his way to a likely prison sentence. Even more worrisome to Republicans is what damage Mr. Trump may do to himself. If the president is seen as thwarting Mr. Mueller’s investigation, either by terminating the special counsel or pardoning allies who are implicated, it would create a far more serious upheaval and force Republican lawmakers into a confrontation they have long avoided.